ANCIENT ISRAELITE RELIGIONEssays in Honor of Frank Moore Cross"A distinguished tribute to a truly distinguished scholar and teacher. "-Catholic Biblical QuarterlyAlthough the Hebrew Bible serves as the main source of knowledge of ancient Israelite religion, much additional information comes from the material and written remains uncovered in the archaeological investigations of the Ancient Near East. 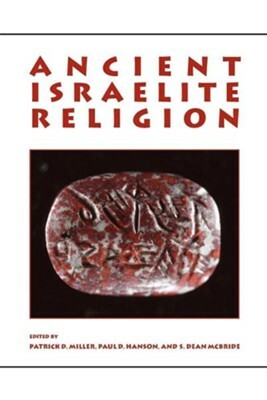 In this volume, internationally renowned scholars examine all of these sources in order to present the most impressive, comprehensive study of ancient Israelite religion yet to appear.The EditorsPATRICK D. MILLER is Professor of Old Testament Theology Emeritus at Princeton Theological Seminary. His books include Interpreting the Psalms (1986) and They Cried to the Lord (1994), both published by Fortress Press. PAUL D. HANSON is Corliss Lamont Professor of Divinity at Harvard Divinity School. He is the author of The Dawn of Apocalyptic: The Historical & Sociological Roots of Jewish Apocalyptic Eschatology (1984) and the editor of several volumes in the Hermeneia series, all published by Fortress Press.S. DEAN McBRIDE is Cyrus H. McCormick Professor of Hebrew and Old Testament Interpretation Emeritus at Union Theological Seminary in Virginia. He is an author and editor for the Hermeneia series published by Fortress Press. I'm the author/artist and I want to review Ancient Israelite Religion: Essays in Honor of Frank Moore Cross.